Indicating the continued strength of content-driven brand marketing, DeSilva+Phillips today announced that its client Affinitive, a word-of-mouth and social media agency and Facebook Preferred Marketing Developer (PMD) that handles consumer assignments for brands such as Random House, E.&J. Gallo Winery, Major League Soccer and Ubisoft, has been acquired by Project: WorldWide. Financial terms were not disclosed. 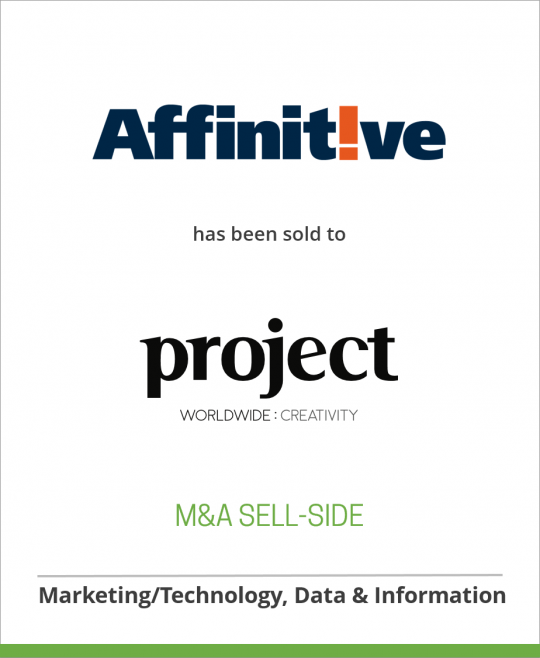 Founded in 2002 and headquartered in New York City, Affinitive provides social business solutions combining innovative consumer engagement strategies with proprietary technology, real-time monitoring and integration with clients’ existing enterprise systems to create a seamless platform for creating and executing integrated brand programs. Over the course of a decade and more than 200 campaigns, Affinitive has created and managed online brand communities, customer insight/advisory panels, loyalty/rewards programs, social and mobile applications, digital promotions and much more. As a founding member of the Word of Mouth Marketing Association, the group is recognized as an industry pioneer and a leader within the industry’s ongoing efforts to evolve social media marketing practices and standards. Affinitive’s creative, technology and strategy teams put brand personality and a customer-centric approach to work on client campaigns, rather than focus on technology for its own sake. This philosophy has allowed Affinitive the freedom and flexibility to create ideas that work across multiple channels even as new social media platforms rise to shake the status quo on a seemingly regular basis. In joining Project: WorldWide, Affinitive is teaming up with a diverse roster of highly collaborative, award-winning agencies including experience marketing agency George P. Johnson, G7 Entertainment Marketing, interactive marketing shop JUXT Interactive, multimedia production content company Spinifex, creative ideas agency Partners + Napier and 3D marketing production shop Raumtechnik. Project: WorldWide is a privately owned, independent and global network of specialized agencies that gives marketers access to big ideas and the ability to deliver those ideas across multiple channels in a seamless, integrated fashion. Project: WorldWide agencies include George P. Johnson, Partners + Napier, JUXT Interactive, G7 Entertainment Marketing, The Spinifex Group and Raumtechnik. Project: WorldWide agencies enable marketers to use engagement as means to improve marketing results and generate greater ROI through more targeted, relevant and meaningful brand experiences that create, deepen and accelerate profitable relationships. For more information, please visit http://www.project.com. Affinitive is a word-of-mouth and social marketing solutions pioneer. Since 2002, Affinitive’s solutions have allowed brands to engage and inspire consumers, cultivating brand advocacy through meaningful and deep engagement. Affinitive has developed more than 200 innovative marketing programs that have engaged millions of consumers across industry sectors, including consumer goods, luxury, wine/spirits, retail, sports/fitness, automotive and entertainment. Headquartered in New York City with offices in San Francisco, Affinitive is a Facebook Preferred Marketing Developer and a founding member of the Word of Mouth Marketing Association. For more information, please visit http://www.beaffinitive.com.